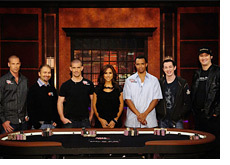 "Railbird Heaven", which is the two-week finale of the fifth season of "Poker After Dark", will begin airing this Monday on NBC. Patrik Antonius, Daniel Negreanu, Gus Hansen, Phil Ivey, Tom "durrrr" Dwan and Phil Hellmuth will all be participating over the two week run of "Railbird Heaven". "Railbird Heaven" will be played in a cash game format, rather than the traditional SNG format that is typically used on the show. The minimum buy-in is $100,000, while the maximum buy-in is $250,000. Blinds start out at $200/$400, but "escalate to $300/$600 within a relatively short period of time", according to a recent press release. -there will be several "flips"
This should be a pretty entertaining couple of weeks on "Poker After Dark". For starters, a massive Phil Hellmuth tilt session is pretty much guaranteed, given the inclusion of Tom "durrrr" Dwan and Gus Hansen. The first episode of "Railbird Heaven" will air late Monday night on NBC.